THEIR ADVENTURE TESTIMONIAL: The photos are phenomenal! We are obsessed! When we viewed them, we both agreed that this has been our favorite session. Thank you for always giving us 110% especially when I message you last minute with my crazy ideas. You’re an absolute gem! I still can’t believe I randomly found you on Pinterest. Latest Adventure Tip: I have been making every couple or family dance for a while now. I don’t know why i didn’t do this sooner because a huge array of expressions always get snapped. I love how you can feel the joy when I asked these two to dance and twirl. My Favorite Adventure Memory: This is my 5th year capturing this awesome couple! Every year I get to see how much their love has grown and that is absolutely magical. To know they trust me with their memories is a total honor. I always listen to every request Arelis has and try my hardest to make it happen. I love capturing their laughter but, I especially love how Brandon looks at Arelis! His love for her gets deeper with every year and I am thrilled to see what year 6 will bring! My Favorite Adventure Image: The image above melts my heart. You can see how much fun Arelis was having and love how she dipped back as Brandon landed a sweet kiss on her cheek. I had to turn it black and white to really focus more on them versus all the colors around them. 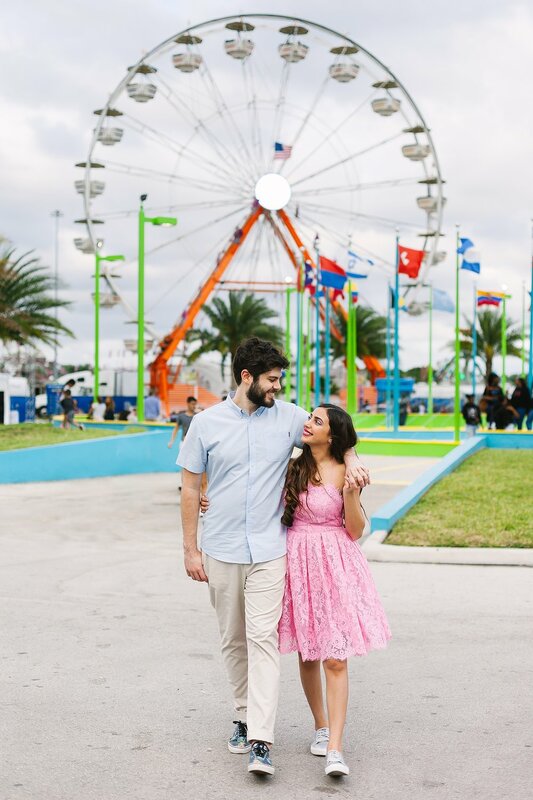 Book Your Adventure: Did this Miami-Dade County Youth Fair couples adventure steal your heart? This could be you and your lovebug! There’s always a festival, fair o fun location ready for us to shoot! Book via the contact tab or shoot me an email at hi@adventureswithbrownie.com. Best decision of your life! Flashback Friday: The Massana family is on of my all-time favorite families! Now, now I love all my clients but, this family has been on adventures with me since the very beginning of my journey! I met these two when they were engaged! We had so much fun capturing their love with the coolest VW bug in Wynwood before it was “Wynwood”. Almost 2 years later I get a call to capture their little man’s 1 year milestone. My, my does time fly! They managed to score the most amazing location as you can see! This specialty auto yard is actually not open for photo shoots. Book Your Adventure: Fall in love with awesome family of 3? This could be you! Just a hop and a skip away from making magic happen! Book your adventure today via the contact tab or shoot me an email at hi@adventureswithbrownie.com. February is one of my most favorite months! Love is totally in the air! I have a super obsession with love so of course I love Valentine’s Day! And 2 years ago today my Blake put a ring on it! Still on Cloud 10! With that said, this is about THE BEST SPECIAL I have ever had! I would love to capture your epic love! Whether you are dating, engaged, expecting, soon to be engaged or married… brand spanking new adventures should be in your near future! Just sayin’! The incredible offer is valid until February 28th, 2019! These will go like hot cakes so take advantage of the savings and book your greatest adventure yet! *Special rate for couples only. Furry pets are always welcome. Weekend dates will incur a $25 fee. Adventures must be booked on a weekday from March 1st-April 30th. The collage above, along with all the gorgeous blog posts are great examples of what to expect. The goal is to capture ya'll looking your best while laughing, hanging out and showing off your personalities! Locations: Any park or urban outdoor location. Investment: 50% non-refundable retainer fee is due at time of booking. A $25 fee will incur for each additional person. Investment also includes my time away from home, travel to and from location, photographic creative eye, consultations and post-processing of final gallery images. Pricing is non-negotiable and non-transferable. All adventure details, exceptions and restrictions will be noted in contract signed by client and yours truly. Booking: Shoot me an email at hi@adventureswithbrownie.com or use contact form with subject "Valentine’s Day Special". Please add your date of interest, if you are in Miami or Broward County. Don’t forget to mention how excited you are about this awesome adventure! My Favorite Adventure Memory: I was truly honored to capture my sister-in-law Carly and her lovely family of 4! Yup, secrets out.. she is expecting in this adventure! Super stoked that we met before she decided to have kids because I get to capture and see her and Timothy’s journey! I have to admit, I don’t usually shoot family members or close friends. But, when in Hilton Head, SC and on a beautiful day… how could I say no? Weather was perfectly cool and the sunset was to die for! We definitely had a lot of laughs and a great workout! Haha! It’s not as easy as it looks folks. Keep scrolling, the tones are just fabulous! This was shot after I told my niece Karis she was going to have a baby sister or brother! Just kidding! She’d never understand but, I feel like she’d funnily react like this! Her personality is super awesome! Their Adventure Testimonial: Love them! Thank you so much! You made this girl cry! #preggerhormones #youmakeuslookgreat! You are a super talented photographer for taking such gorgeous photos during a perfect Hilton Head sunset over Christmas! We are so in love with these photos! Book Your Adventure: Expecting a amazing bundle of joy? Are you wanting to upgrade your sweet family pictures? Let's set up your awesome adventure right now! Book via the contact tab or shoot me an email at hi@adventureswithbrownie.com. Best decision of your life! Welcome to my blog! There is so much love, laughter and epicness to explore. I'm obsessed with my killer hyena laugh that has a 98% chance it will make you bust out laughing. I will totally convince you to shoot at sunset for that yummy magic hour I love so dearly. Grab a cup of joe and fall in love with my art. "Never lose confidence in yourself, you never know who is looking up to you." No munchkins nor couples were harmed in the making of this site in 2019.